meant to work on your divine self. animals, they are wild. But in wildness there is also a quality that is beyond dualism. see how he was going to get that cow into the bath. him to the bath, the monk had become silent. So Nansen asked Joshu what he would have said. enjoying his disciple’s answer very much. situation radiating brightly, without any disconnection between things, without any dualism. Here is another way of looking at this question. We have a name, and we are alive right here. and a before and an after of birth. In Buddhism, right here, right now, everything is eternally alive. We are all beings. There is no sense of anything being separated; there is no dualism. call or that sun’s shining or that moon’s light. We become true awareness and fresh aliveness. here. From here Buddhism is born. going through practice into ten simple steps. 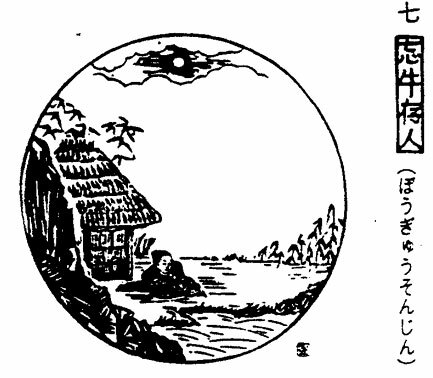 hungry ghosts or the human realm or the hell realm, without rest, without pause. Until now, the ox has never gone astray. Why then does he need to search for it? right and wrong rise round him like blades. no place allows him refuge. He listens–there’s just the evening’s shrilling of cicadas in the trees. where have these come? And how are they different from this original essence? but has the including of those ever made the universe any smaller? mind, into that mind which is emotional, that mind which is dualistic, that mind which is intellectual. we go to our health club and work out, expecting to be able to resolve our problems in this way. people or to planets; it is that world of zero. of one–is prior to this world of two. And that which uses the world of one is even prior to that. wispy thought, and then another associates with that, and another with that, and another with that. rights and their own material possessions. this way, the idea of equality is unresolvable. That is the greatest problem on this earth today. respect and love each other deeply. that way, we turn away. scratch an itch on our foot from the outside of our shoe. What is the good of any of this? can’t figure out any of this. I may as well go home. We all think this. Everyone has thought this. stay, deciding to go, deciding to stay, deciding to go, and then finally staying. cannot be resolved all at once. But once you have started, just keep that effort going. could it hide from others its snout turned up at the sky? the source, but we have to be clear about what the best traces are. mouth, you can see this easily. We need oxygen to stay alive. We must have water to live. sequence, down to our grandparents, and then to us: we all came forth from one moment. ten thousand things come forth from me and I become all of those ten thousand things. that among human beings there is no differentiation. the cushion it dissipates in every direction and we don’t know how to keep it going. metaphor; rather, as we listen openly, the sound made by the pines is a sermon of the Buddha. spoken in every moment. In every single sense we can feel and experience this truth. just as it is, is that clarity of the true nature. become the sun. Seeing a bird, we become the bird. Everything is embraced, every single bit of it. The whole universe is the ox of our own clear mind. salt in water, or glue in paint. Raise your eyebrows–it is nothing other than yourself. On the tree branch a nightingale sings, warm sun, soft wind, green willows on the bank. Now nowhere for it to hide, its majestic horns no artist could draw. 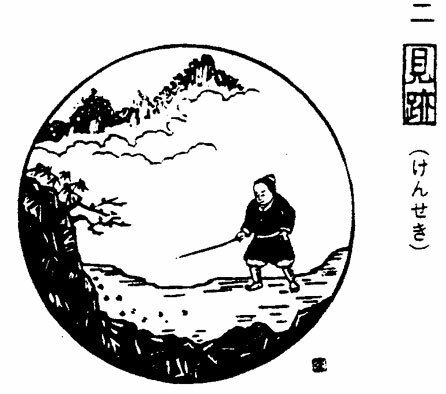 died, Kyogen Chikan went to train with Hyakujo’s senior disciple, his brother disciple, Isan Reiyu. and quiet his mind must have become. philosophers call this the pure experience–he knew it from himself completely. coming and going in and out of the orifices. If you have not seen this True Person yet, see it now. always know this place which is fresh and new. notion or idea or past experience; we must know only that flow of life energy. encounter a sound, and at that moment we are able to hear. The same is true of tasting a flavor. clearly if we sit with too much tension. We must always see with a fresh, clarified mind. 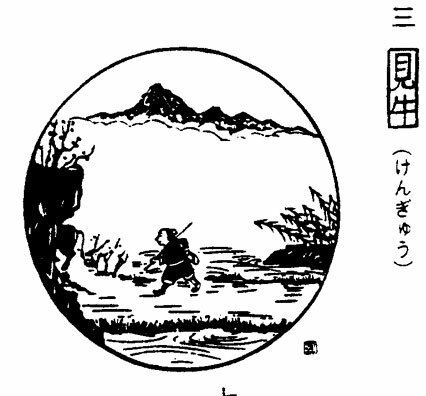 woodcutter gave up and said, “This is a useless chase.” And he went back to cutting trees. the woodcutter’s hatchet suddenly flew out of his hand and knocked the bird right into his hand. 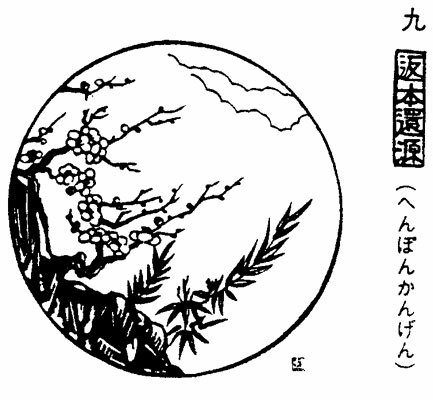 for enlightenment is satori, so the bird in this story is the tori of satori, the bird of enlightenment. way to imitate another person’s realization. But those imitations can never be the real thing. cannot put it to use. We do not know this ox freely. waste this precious opportunity of doing sesshin here together. must lay on the whip. soon as he gains the high ground, it vanishes once more deep into the mist. everyday life as we want to. We cannot yet give function to its essence. cannot yet come to life. again on an idea of having understood something. such a big, burdensome way. assassins had been justified in shooting them. Suddenly, she knew she should not have come. this nature in the world today. and truly, then we know what our responsibility is, and we take it. last bit of it has to go. objective world, but only because of the mind. Keep a firm grip on that rope and do not waver. 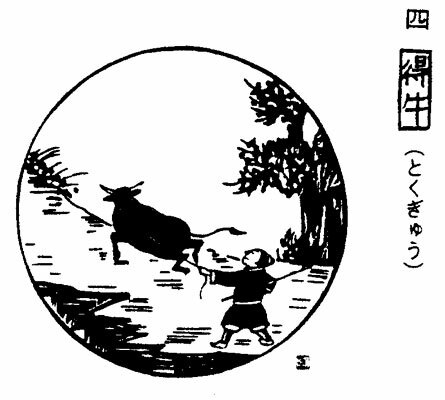 Let drop neither whip nor line even a moment lest the ox wander back to dust and desire. Tame this bull and it will be pure and gentle. Without fetters or chain, of itself, it will follow. deepening of our samadhi, that practice of zazen in stillness. 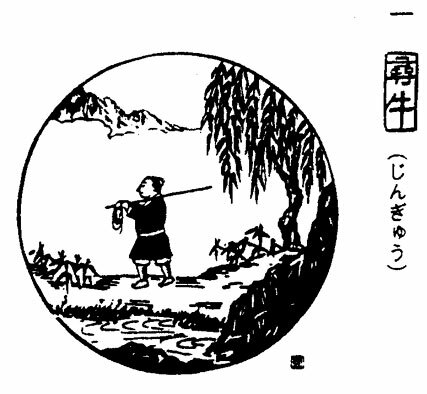 thoughts, until we catch the ox, until we suddenly know that mind of no thought remaining. maintain our center and concentration. This is called samadhi in action. the mind of Taming the Ox. But that is only a part of it. We cannot do everything with our own will. and a child is reflected. When something comes in front of a mirror, it is reflected exactly as it is. mind directly: this is Taming the Ox. true thing of it, then our words will only be empty discussion and empty explanations. have a dualistic idea about it. It happened to everybody at exactly the same time. then remembered his family. Wait, how are they doing? Are they alright? And he called to them. The victims were all one. They had all fled the destruction that had come in the early morning. and moving spontaneously and naturally in accordance with them. knows what needs to be done for it? have been able to experience this essence but not have been able to ripen it and keep it going. We have to be able to tame the ox as well as to have that glimpse of it. then it becomes extremely difficult to keep that mind of no thoughts clear and in focus. thinking to being in a place where we can bring brightness to everyone around us. To think that we are doing something good when we work for others is completely upside down. of how good we are, to do it continually takes great determination and hard work. state of mind that is clear, free from any caught places whatsoever. truth has no form, yet it moves in all ten directions. The true master is free in every situation. where no matter what is encountered, we are not moved around by it. home, not even needing the reins any longer. been there all the time. We have never been separated from this ox. We are always at one with it. village songs and plays children’s country tunes. 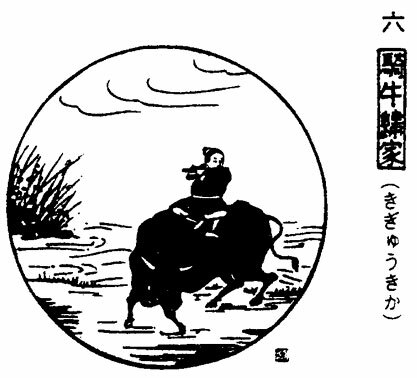 Lying back on top of his ox, he gazes at the sky. live with a large, expansive sense of how things really are. There is a story about a woman who married the man she loved and knew that life was good. did this have to happen to them? And finally she knocked on the door of religion. about the child? What about his future?” And she couldn’t accept the teaching of this first religion. that way, and for what? them as well to treat their brother as a gift from God. “Now I’m eighty years old, and my son is fifty. by this, and by hearing our story.” All of this came from this one mother’s great kind quiet mind. the ground, with no attachment to any concepts such as good or bad or win and lose. single moment, in every single thing that we encounter. day.” But it’s not so easy to arrive there. that essence will extend throughout the heavens and the earth. with loquat leaves, which he had learned how to do from the priest of a temple called Konchiin. what is being talked about in Riding Home on the Ox. yet still he dreams, old whip and line put away in the woodshed. those forms and become that practice. From the point of view of society, we need good policies, a strong economy, and good jobs. mistakes or a fear of not being able to maintain our status, and we lose ground. essence of becoming one with God–this is the sixth picture. But now we have the seventh. small self left, it won’t be like this. the point. Our experience has to become that experience of all beings, of all humanity. 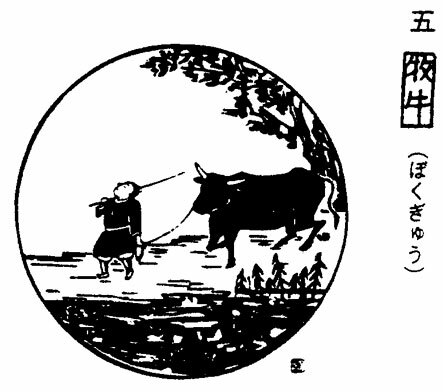 “The dharma is not dual; the ox just stands for the actuality.” Why has this ox been used then? way, the ox, because of the necessity for it, has been given as an expedient means. borrowed and used to liberate us to this place where we are “not two,” where we are not divided. rather use them to realize this place. Otherwise we will all become slaves to these systems. front of it, fully revealed, unmoved. When they passed through the gate, he saw many different doors, labeled in many different ways. more. He expected to see great pools of blood and many terrible things in Hell. rope, and he understood. Once we have a position, a place to sit in, we do not want to let go of it. long spoons in their right hands with which they could not feed themselves. and Hell were exactly the same; the only difference was in the state of mind of those living there. he woke up in his bed and realized it had all been a dream. eyes that the welfare of all six billion people on this planet is being taken care of. praised, we are not concerned. At any moment, at any place without fear, we accept it all as it is. when it’s on a bright red leaf. that would be a disgraceful scene. completely, we have the world of Forgetting Both Person and Ox. explain Buddha Nature–have all been thrown away completely, Forgetting Both Person and Ox. this direction, or it ‘s not Forgetting Both Person and Ox. the sky without a single cloud–but often this emptiness was looked at only through concepts. enlightened and free from preferences, to not be caught on either of these, how is it? whatever it is completely, to forget ourselves in the doing of it completely–this is the Path. darkness, compressing everything into it, until there is no place for even a single thought to enter. more ideas of enlightenment or no enlightenment or having understood or not having understood. honored him, bringing him food and flowers. 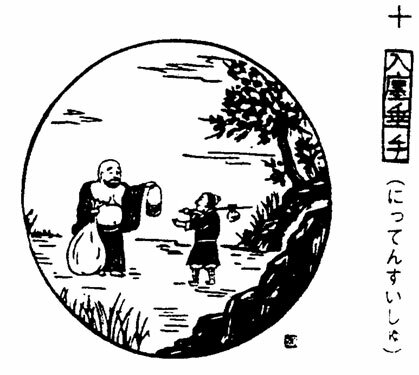 When Doshin heard of this monk, he went to see him. something good, we are only putting an enormous pressure on the person we are trying to help. state of mind, and a very important one. the green mountains–he just sits and watches them rise and pass away. however, is the basic standard from which each person decides what to do. in waves or particles. These are some of the ways of looking at it, but there many others as well. Forgetting Both Person and Ox, what is then manifested is this Return to the Origin. must become this and know this from our own experience. not even know if we are standing or sitting and are no longer pulling along anything whatsoever. brilliance of all things shining, coming forth of their own–that is the world of Return to the Origin. nothing inserted in between–is the place that anyone would experience in exactly the same way. become blind, deaf, and mute. Return to that state of mind, or you will never know that wonder. past and future, then we cannot experience the actual essence of each thing: That deep truth. 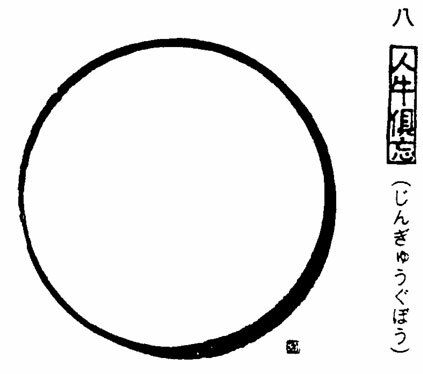 and Ox is an empty circle, then Return to the Origin is the place where everything is reborn from it. All alone, the gate shut so tight–not even the thousand sages can comprehend. up at the drinking places and fish stalls to awaken all to their buddhahood. trees at once burst into flower. doing zazen. And he left behind a poem about Maitreya. Maitreya, Maitreya, we are all Maitreya ourselves. We are all part of that great vow that all shall be liberated. The vow itself is what Maitreya is. But even though that is true, people cannot hear it and know it, even when it’s told to them. For one whole life, priest Hotei lived as an expression of Maitreya. common. Today, that original childlike mind, pure and eager, is not so easily found. up all delusion, anger, and ignorance. comforting, because that person is not caught on anything, or looking for anything. suffering. In fact, babies are without emotional content; they are giving a great call of life energy. state of mind. We are with them the entire time, all day long, and with them we rest. than like ice, which can only enter a container of its own shape and otherwise is cumbersome. The true nature is our Original Nature, which unites all of us, with which we are all endowed. compassion to all beings. To bring forth this awareness is the beginning–it is Searching for the Ox. And then we begin to experience this mind and work with it–this is Finding the Tracks. said we can know that God has not given up on humankind because he still gives us children. to know clearly this true nature in all beings. place, the true mind of all the Buddhas? is the source point of enlightenment, and we can know that when we make that vow. that are being taught in the Ten Oxherding Pictures. thank everyone for listening to these teachings.